Husseini giving the “Heil Hitler” Salute to Bosnian Muslim volunteers to the notorious Waffen SS Handzar Division in November 1943. No one can accuse Israel’s Left of missing a beat. But the attentive ear of our homegrown self-appointed guardians of other people’s consciences is selective. All sorts of blood-curdling incitement throughout the Arab/Muslim realm fail to resonate with them. Yet they amplify with relish any aside by the true objects of their animus – Prime Minister Binyamin Netanyahu foremost. 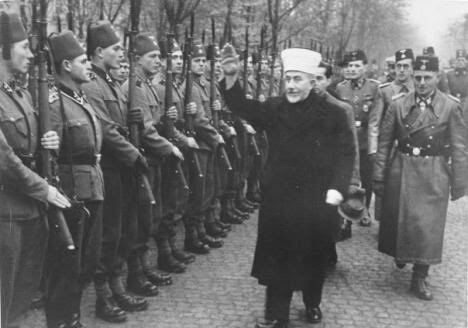 And so, the other day Netanyahu had the temerity to remark that the Palestinians’ still-venerated Mufti Haj Amin al-Husseini opposed Hitler’s initial plan to merely ethnically cleanse Europe of Jews and exile them to such exotic locations as Madagascar. Husseini insisted the Jews burn. It’s important to note that at the time of Husseini’s meeting with Hitler in June 1941, the “final solution” hadn’t yet become official Third Reich policy (despite slaughter that had already begun in occupied Eastern Europe). The Final Solution would be formally adopted only on January 20, 1942 at the Wannsee Conference. For outward appearances at least, Germany’s declared objective was to expel Jews from Europe. Husseini couldn’t abide the thought and railed against mere banishment. He clamored for the Jews’ physical obliteration instead. This doesn’t mean that he inspired Hitler or that he gave him the idea for wiping all Jews out but it does powerfully attest to the mindset of the then-principal leader of the Arab world. But who cares about fine distinctions? Instantly, a great indignant outcry arose from the righteous ranks of the Left. 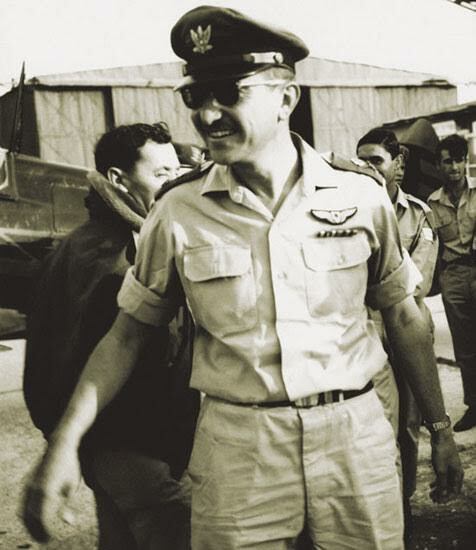 Netanyahu, it was bewailed, is cleansing Hitler of guilt and pinning it on Husseini. It’s as if villainy can only reside in a single persona and the villain’s kindred ideologues and avid accomplices are therefore unjustly accused. 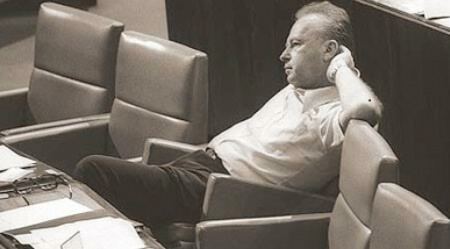 Rabin in the Knesset (c. 1976)- He was hardly the dove that leftist historiographers posthumously portray for propaganda purposes. We had recently been informed in rather dramatic headlines that during his first stint as prime minister, Yitzhak Rabin had denigrated settlement movement ideologues “a cancer.” No less. This supposedly startling revelation came from a hitherto never-broadcast 1976 interview granted by Rabin to an unnamed Channel 2 reporter. The segment features in a documentary Rabin: in his own words, which was aired at the Haifa Film Festival. There – how unsurprisingly – it was crowned best in its category. Presumably Rabin’s antiquated aspersion should have sent us all dutifully reeling with shock. 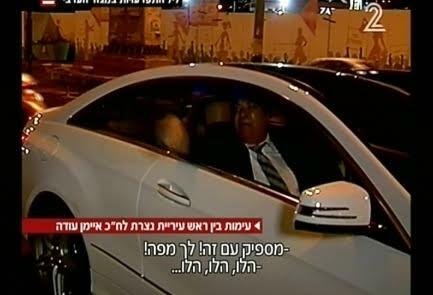 Channel 2 screenshot of Nazareth mayor Ali Salem yelling at MK Ayman Odeh. The latest expression of such “anger” took place last week when throughout Israel’s Arab communities businesses shut down for a day. Doubtless many were forced to do so but the truth is that many others were willingly swept up in the well-orchestrated volatility. What did they aim to achieve? Whom did they aim to hurt? Surely they realized that they are only shooting themselves in the foot. Their strikes simply and serially fail to awe the mystified Jewish majority. The only effect strikes have, if any, is to hone even further the already deeply ingrained impression that this country’s Arabs side unequivocally with Israel’s existential and implacable foes. The aftermath of Hassan Manasrah’s handiwork in Pisgat Ze’ev. 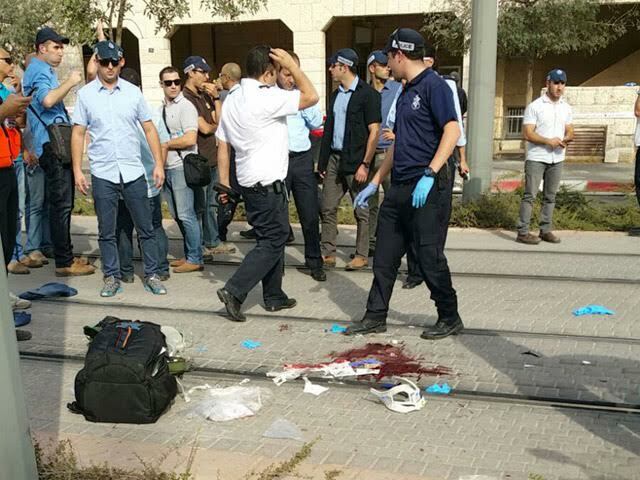 Directly inflaming passions, Nabil Abu-Rudeina, spokesman to Palestinian Authority chairman Mahmoud Abbas, declared on Tuesday that 15-year-old Hassan Manasrah (who gravely wounded an Israeli 13-year-old and stabbed another passerby in Jerusalem’s Pisgat Ze’ev neighborhood) had been “cold-bloodedly executed” by Israelis. PLO Secretary-General Saeb Erekat vowed to seek the prosecution of Israel’s leaders at the International Criminal Court for ordering “extrajudicial executions.” He embellished his accusations with provocative descriptions of martyred Palestinians being shot in the streets “like dogs” for no reason and left to bleed while they are cursed and brutalized. Here clearly are comprehensive statistics that illustrate exactly how the PA uses its resources. 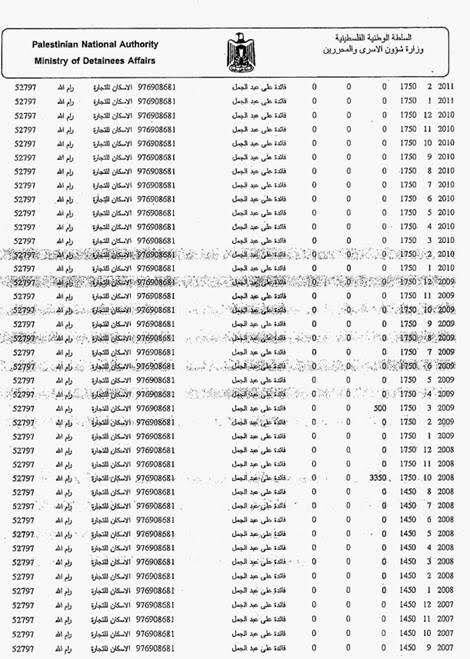 One of the most significant recent scoops came from Israel Radio’s Palestinian affairs correspondent, Gal Berger, who managed to lay his hands on actual Palestinian Authority spreadsheets that show precisely which convicted terrorist behind-Israeli-bars is subsidized and to what tune by the Palestinian Authority. Normally rows and columns of financial data hardly make for a riveting read. But this case constitutes a striking exception. Here clearly are comprehensive statistics that illustrate exactly how the PA uses its resources – including moneys handed over monthly by Israel as well as contributions the PA solicits from international donors. The analysis of the figures is singularly enlightening despite the fact that the general bottom line is hardly astonishing or unanticipated. That said, niggling doubts persisted all along at the back of our minds. There always preyed the bothersome hypothetical of what would happen if the Arabs Ezer wisecracked about would wise-up and quit being too pigheaded for their own good. Now it seems that what we distantly dreaded has finally come to pass. Foreign news purveyors tend to sanitize terrorist crimes against Jews – when they at all bother to report them. They also dehumanize Jewish victims when referring to them by generic designations with distinct derogatory nuances. The heartrending tragedy of Adele Banita offers a stark case in point. 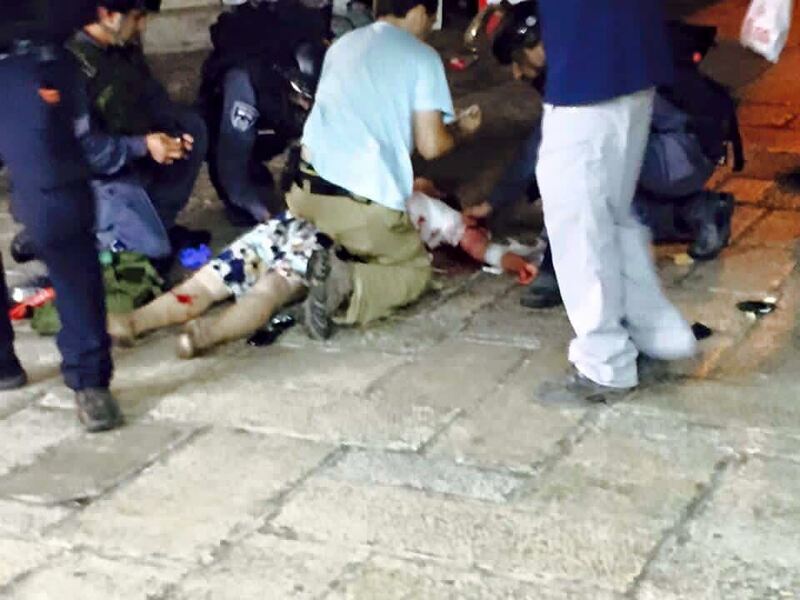 She, her husband and two babies were attacked by a knife-wielding Arab terrorist on Jerusalem’s main Old City route to and from the Western Wall. Aharon Banita was stabbed to death and one toddler was slashed. Adele escaped the murderer’s grasp – and with his blade still stuck in her neck – ran to raise the alarm, to save her children. The hijinks and tomfoolery of America’s presidential election season suffice to confound the minds of the diminishing numbers of Americans who remain unfashionably focused on issues. The raucous monkeyshines parading as the democratic process in action surely stupefy outsiders. These shenanigans really shouldn’t preoccupy Israelis and it’s altogether not our place to pass judgment. Still, sometimes it’s awfully hard to keep our distance and our cool in the face of hypocrisy that cries to High Heaven. Moreover, opinion-molders in the Land of the Free prefer to keep their news-consumers politically correct and suitably uninformed. Hence, odds are that most of the minority of eligible primary voters and caucus participants (who actually play a role in the democratic process) won’t connect the dots.